The different Catasetinae are all easily cultivated once you understand their growth habits. Some are easier to grow than others. Hybridizing within and between genera can also help overcome whatever cultural difficulties are inherent to a specific genus. 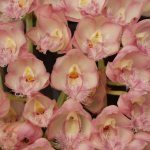 We're are grateful to Fred Clarke of Sunset Valley Orchids for the use of his photographs. Catasetum. Catasetums are the most easily grown of all the Catasetinae. They are vigorous growers and are less sensitive to cultural mistakes than the other Catasetinae. Catasetums can flower with male or female flowers that sometimes are quite different from one another. This male/female flower trait is called floral dimorphism and it adds interest to the flowers, but it is the male flowers that are generally the showiest. Another aspect of the dimorphism particularly in Catasetum, is the male flowers’ ability to eject or shoot their pollinia. Read More: Catasetums with Unisexual Flowers (Stephen Batchelor, AOS). Clowesia. 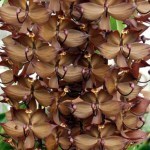 Clowesia are strong growers that are very resistant to rot. They are similar to Catasetums in cultivation though the blooming cycle is very different. Clowesias will throw off multiple flower spikes in the winter/early spring time frame. Repotting should be undertaken after the bloom cycle. Clowesia have perfect flowers with both male and female floral segments. 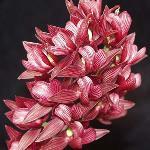 Read More: Catasetums (now Clowesias) with Perfect Flowers (Stephen Batchelor, AOS). Cycnoches. Cycnoches are susceptible to rot. At best, pseudobulbs last two or three years. They grow and flower their first year, produce another pseudobulb the next, and decline and die by the end of their third year. The male and female flowers are both attractive and similar in form to each other, though the female flower often has larger segments. Read More: The Swans of Cycnoches (Stephen Batchelor, AOS) and The Hydras of Cycnoches (Stephen Batchelor, AOS). Mormodes. Mormodes have a reputation for being more difficult to grow. They are the most susceptible to rot. The floral segments are often twisted and intensely colored. Mormodes have perfect flowers with both male and female floral segments. Dressleria. Dressleria is another Catasetinae genus that is seldom seen in cultivation. This genus has perfect flowers, of very waxy substance and ivory color with a delightful fragrance. The plant is relatively small and looks like a miniature catasetum in growth habit. It keeps its leaves for two or three years and does not require a drastic drying period like catasetums.